RUSSIAN PRESIDENT VLADIMIR Putin has dramatically raised the stakes in the Ukraine conflict by calling for the first time for statehood to be considered for the restive east of the former Soviet state. “We need to immediately begin substantive talks … on questions of the political organisation of society and statehood for southeastern Ukraine with the goal of protecting the lawful interests of the people who live there,” Putin was quoted as saying by Russian news agencies on a TV show broadcast in the far east of the country. 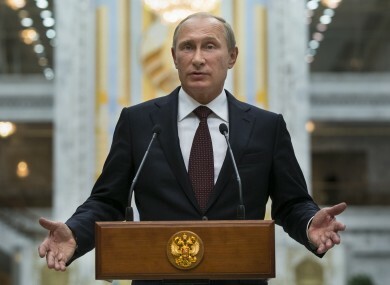 In the programme, taped on Friday, Putin did not directly address additional Western sanctions on Russia. Putin has denied that Moscow has sent regular troops to fight in Ukraine, but pro-Russian rebels have said that many Russian soldiers have volunteered while “on vacation”. Email “For the first time, Vladimir Putin's raised the prospect of giving east Ukraine 'statehood'”. Feedback on “For the first time, Vladimir Putin's raised the prospect of giving east Ukraine 'statehood'”.